Is a non-profit World War 2 military artifacts institution and private museum. 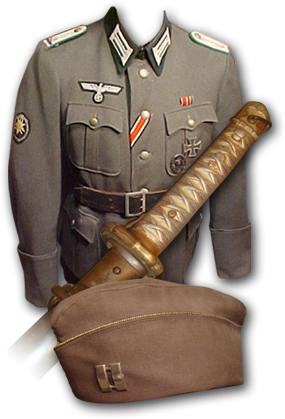 We specialize in research, authentication, appraisal, and procurement of World War 2 artifacts. Our mission is to save through acquisition, World War 2 memorabilia that otherwise would continue to be improperly cared for or even worse, lost forever. However, we can only accomplish this with the help of those interested in preserving World War 2 artifacts that otherwise would go unknown to fellow researchers and to the public. As members of the prestigious Sotheby&apos;s.com, The Company of Military Historians, and as consultants appraisers to numerous museums and historical societies throughout the world, we strive to enlighten and share with those interested in World War 2 history. If there is any World War II item you would like to see preserved and not sold to dealers then please contact us. Our passion is to preserve these wonderful artifacts so generations can understand the sacrifices our families made in such a time of trial and perseverance. As buyers of World War II militaria, we offer a safe and reliable method for both The Preservation Trust and our clients. The World War 2 Preservation Trust offers a safe and confidential method to divest and preserve your WWII items. Please contact us for more details regarding our purchase policy. You will find that along with our services, we also offer periodic articles pertaining to a particular subject matter or artifact; for example, one month we may explore the Waffen SS Steel Helmet and in another month we may explore reasons the German Tunic was designed the way it was. The information contained in these articles will prove to be an invaluable resource for those wishing to learn more about World War 2 equipment, weapons, and the personal items of the soldiers themselves. We want to help individuals, collectors, and institutions identify and authenticate the World War 2 artifacts they may have; from firearms, daggers, flags, uniforms, and weapons and equipment of any kind. We are NOT militaria or antique dealers. We are however military preservationists who constantly seek the opportunity to procure genuine World War 2 memorabilia for our museum collection. We believe historically significant artifacts should not be traded or sold off randomly without any regard to their historic significance. As you can see, we feel very strongly that World War 2 artifacts are to be shared and not remain in trunks or boxes, never to be given the proper respect, research, or preservation they deserve. Have Questions or Comments on WW2 Militaria? We have served as consultants to museums, auction houses and historical societies throughout the Country. Our goal has always been the education and enlightenment of all those interested in the history associated with this intense period of our Nation&apos;s past. We welcome the opportunity to speak with you. We go to great lengths to provide the most accurate results available for the items we examine. We are constantly consulting with other institutions and individual experts. Your confidentiality and satisfaction is our highest priority.